One of the most infuriating insects to homeowners all around the globe is ants. No matter the region, ants find their way into homes, making life harder for homeowners. Ants are small insects that live in groups called colonies. Each ant in the colony serves a purpose to help the colony grow. Queen ants are female ants that start and help produce ants to populate the colony. There are also male ants which help the queen ants populate the colony. The ants that are not fit to reproduce are designated to be workers. Worker ants each performs a different task to make sure the colony is thriving and healthy. These tasks may be cleaning the living space, protecting the queen and finding food. While there are numerous types of ants found in the world there are three types of ants that are commonly found in the homes and properties in the Pacific Northwest. Carpenter ants get their name from their tendency to establish their colony in wood. 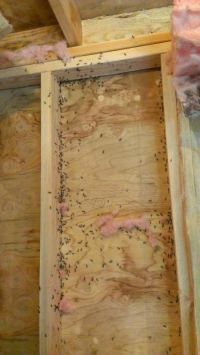 This is troublesome for homeowners because this means that any form of wood is a potential residence for this type of ant. Carpenter ants will gravitate to crawl spaces, attics and walls that have plentiful access to wood but are also free of human traffic. These ants will burrow into the wood to build their colony which makes the wood around them weak. This can reduce the strength of the house structure and be dangerous over time. Odorous house ants, or commonly referred to as sugar ants are similar to carpenter ants in that they establish their colony in homes. However, they are different because they are noticeably smaller in stature. Furthermore, they are not harmful to the home nor do they pose any threat of biting or stinging humans. These ants are particularly challenging to eliminate due to each colony having multiple queens. When the queens feel threatened they will move the colony site. Additionally, the worker ants who are tasked with finding food are very aggressive which means that many ants may enter your home in the pursuit of food. Pavement ants are another type of ant that is common to see in the Northwest. These ants do not set up their colony inside the home, but rather choose to do so in the dirt under a rock, driveway or walk way outside of the home. These ants leave a trail of mined dirt that can be visible on the surface as their home grows. These ants will often venture into homes in the search for food, but do not pose any threat to humans or to the home structure. 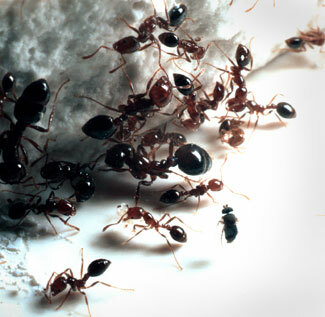 These ants all are a nuisance to homeowners and can cause life in the home to be challenging. If you have these ants in and around your home it is time to take action to eliminate them. There are a number of strategies that we are comfortable using to help you regain control of your home. Contact us to get some further information about.